Do you have a hidden fortune waiting in your outdoor dining area? We’ve helped dozens of cafes and restaurant turn dusty decks and damp courtyards into thriving spaces full of comfortable customers. Custom built to make the most of your outdoor area and made from quality materials proven to last in our harsh weather. Popular with restaurants, bars, and cafes. Find out more about how a dining structure can help extend your usable space and attract more customers. 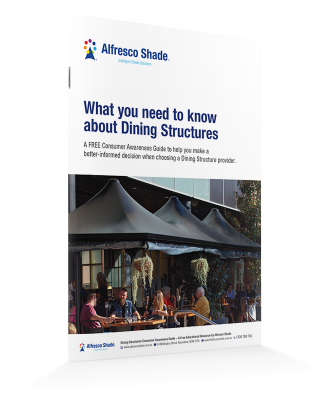 What you need to know about Dining Structures. Everything you need to make an informed decision on your next project. The ever-popular street dining option. Maximum table space undercover with no centre mast to get in the way. A timeless classic design. Great for large spaces and budget conscious customers. Popular with restaurants and cafes. A good choice for large scale builds. Comfortable customers in any weather. Custom built wall mounted or free-standing options to perfectly match your property. Valuable advice to transform your property. Includes a shade audit, fabric recommendations and layout tips.